Please refer to our stock # SN123 when inquiring. 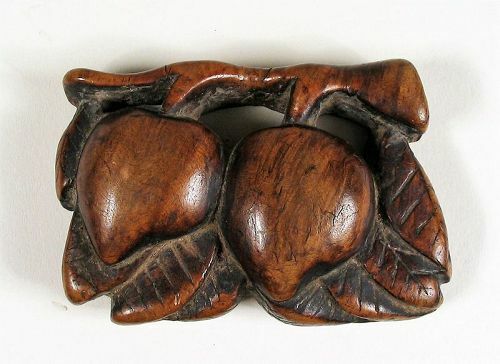 DESCRIPTION: A nice old Chinese toggle carved from a striated wood in the form of two peaches. The peach is a symbol of longevity, and this thick toggle has a wonderful aged patina that only comes from age and handling. Strung with a cord through the holes under the stems, it would have hung from a sash and been used as a counterweight to a tobacco pouch or other utilitarian object. A wonderful example of Chinese folk art, this toggle dates from the 1700’s. DIMENSIONS: 2 ½” wide (6.4 cm) x 1 ¾” high (4.5 cm).